Delegate: Prof. Luís Gato , Instituto Superior Técnico (IST), IDMEC - Instituto de Engenharia Mecânica. In 2018, WavEC, IST, INEGI, University of Algarve and other Portuguese Universities, public and private entities were active partners in national or international research efforts on ocean energy. The granting support by the Blue Fund (Fundo Azul), a new national funding scheme launched in 2017, aimed at developing the blue economy, has been announced during the year. There has been continuous progress with the oscillating water column and air turbines, following decades of research in Portugal with this type of wave energy technology and its power take-off. A new turbine prototype has been tested in one of the OWCs of the Mutriku breakwater and further on a floating OWC prototype in the Basque country, at Bimep. AW-Energy continues active in Portugal, progressing with its project to be installed in Peniche. In Portugal, the Ministry of the Sea is responsible for defining policies encouraging the development of new activities in the sea that maximize the use of its resources, generating economic value in a sustainable model. In this sense, the Government programme has a medium- and long-term strategy for the use of the resources of the sea, in which renewable marine energy (wave and offshore wind) is of special relevance. 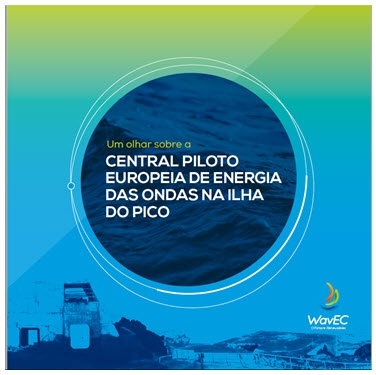 Portugal’s Industrial Strategy for Ocean Renewable Energies (EI-ERO) was published in 2017 and is based on two main goals: to stimulate export and value added investment and to assist industry in reducing risks. The corresponding action plan defines that business opportunities in wave energy for Portugal should focus on having the right conditions for attracting R&D investment, in terms of infrastructures and financing. At national level it is estimated that there is a potential between 3 and 4 GW, considering other uses of the sea. The approach to the wave energy market is pursued in three stages: (i) technology development and demonstration by 2022; ii) pre-commercial development between 2023 and 2028; and iii) commercial maturity, with significant activity in 2030. In Portugal, electricity from renewable sources from plants registered until 2012 is mainly promoted through a feed-in tariff (FiT). Since 2012 no guaranteed remuneration scheme has been approved for new projects. The funding of the Portuguese research system is mainly conducted through the Foundation for Science and Technology (FCT), under the authority of the Ministry of Science, Technology and Higher Education. FCT has been funding research on ocean energy via the Ocean Energy European Research Area Network (OCEANERA-NET) programme. This was a network of 15 national and regional funders of research and innovation programmes, from 8 European countries, which have received funding from the European Union under the Horizon 2020 Programme for R&I and ended in February 2018. 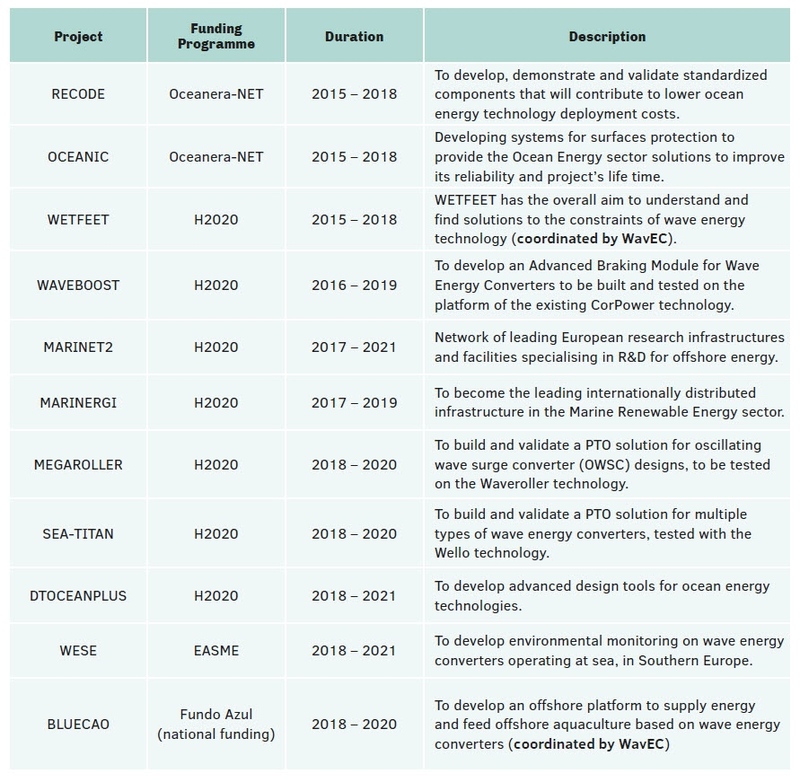 Built on the work of this programme, the Ocean Energy ERA-NET Cofund (OCEANERA-NET COFUND) was initiated, operating from 2017 to 2021, also supported by the EU’s Horizon 2020 Programme, involving the participation of 8 national and regional government agencies from 6 European countries. The participating countries/regions are: the Basque Country, Brittany, Ireland, Pays de la Loire (France), Portugal, Scotland, Spain and Sweden. The aim is to coordinate support for research and development in ocean energy, to encourage collaborative projects that tackle some of the key challenges identified for the sector as it progresses towards commercialisation. The national funding commitment for the next call (5 April 2019) is €300.000 with a maximum requested funding for each project with Portuguese participation or coordination of €150.000. In 2018, the Sea Policy General Directorate (DGPM) announced the results of the call Blue Fund for the topic Ocean Renewable Energy – “Leading Wave Energy Research” aiming to fund research and development projects on demonstration prototypes for wave energy systems and/or components. The budget allocated for this call reached a total amount of €1.000.000 with a maximum grant per application of € 200.000. Blue Fund is an innovative public financial instrument, managed by the Ministry of the Sea, which started in 2017 focused on the development of the ocean economy, scientific research and protection of the sea environment. It prioritizes the development of sea biotech start-ups, underwater robotics, innovative shipbuilding, ocean energy, aquaculture technology and innovative solutions for ocean protection, safety, monitoring and surveillance. Six projects have been approved for wave energy demonstration projects and robotic equipment for operations in the sea, led by the following Portuguese institutions: WavEC, IST, inanoEnergy (University of Porto), In2sea, Composite Solutions and Abyssal. Portugal 2020 framework programme is organized into four thematic domains, one of which is dedicated to Sustainability and the Efficient Use of Resources. The global budget for this programme running until 2020 comes from the European Structural Fund aiming to stimulate economic growth and job creation in the country. Within this framework, the Competitiveness and Internationalization Operational Programme (Compete 2020) opens call for all sectors without distinction, not address specific levels of technological readiness. Ocean energy demonstration projects can apply to this programme, managed by the National Innovation Agency in Portugal (ANI). In late 2018, three new European funded projects were approved, ETIP Ocean2, an European Technology and Innovation Platform for Ocean Energy, funded by H2020 and BLUEGIFT funded by Interreg Atlantic Area Programme. This last one, managed by EMEC, will give the opportunity to promote open sea testing in Portugal. Centre for Marine Technology and Engineering (CENTEC), whose involvement in ocean energy is more recent. Following previous years, the activity at IDMEC concentrated on wave energy conversion, especially the development of new types of oscillating water column converters (OWCs) and self-rectifying air turbines. An important area of research at IDMEC is latching control of floating and fixed-structure OWC converters, taking advantage of new types of air turbines fitted with fast valves. IDMEC/IST was a partner in the WETFEET project coordinated by WaVEC (European H2020 programme) that terminated in May 2018; in 2018 the involvement of IDMEC/IST concerned mainly the development of a multipurpose platform made of OWCs wave energy converters that has been tested at 1:40 scale at Plymouth University. IDMEC/IST is also a partner in the OPERA project (H2020), in which, jointly with the Portuguese company Kymaner, designed a prototype of the biradial self-rectifying air turbine with a new type of fixed guide vanes and a fast valve. The turbine prototype was supplied by Kymaner, and was installed at one of the OWCs of the Mutriku breakwater (Basque Country, Northern Spain), where it was operated under real sea conditions until July 2018. In October 2018, the turbine-generator set was installed on the MARMOK-A-5 spar-buoy OWC of the Spanish company Oceantec/IDOM, and is operating at the BiMEP test site (Bay of Biscay, Northern Spain). Another wave energy converter concept has been under development at IST: the UGEN, a floating device with an interior U-shaped oscillating water column and a self-rectifying air turbine. A 1:24 scale model was tested in 2018 at the wave tank of Plymouth University, UK, within the framework of the European programme MARINET 2. Biradial turbine installed on MARMOK-A-5 spar-buoy OWC, at Bimep, Basque Country, October 2018 (left). Model of UGEN at the wave tank of Plymouth University, UK (right). Ocean energy is a major area in the diversified activity of CENTEC/IST. The activities at CENTEC in ocean energy involved a wide range of topics covering waves, tidal currents and offshore wind. The characterization of the wave energy resource (and to a much lesser extent tidal and offshore wind energies) at various oceanic locations in the world has been one of the dominant topics. The study of ocean energy conversion focused mainly on wave energy converters, with numerical theoretical/modelling and model testing of several types of devices and arrays, and also PTOs (namely hydraulic-circuit PTOs). OpTiCA – Optimisation of Tidal Energy Converter Arrays: a 2-years project funded by H2020 that aims to provide a significant contribution towards the understanding of (a) the effects of Tidal Energy Converters (TECs) interactions with the environment; (b) the capabilities and limitations of common strategies used for the numerical modelling of TECs; and (c) how to mathematically formulate optimisation models to solve the TEC array layout problem considering technical, socio-economic and environmental constraints. This project is led by the Marine Offshore Renewable Energy (MORE) team from the University of Algarve (https://www.msca-optica.eu). MONITOR - Multi-model Investigation of Tidal Energy Converter Reliability: a 3-years project funded by the European funding programme INTERREG Atlantic Area, that started in 2017, led by Swansea University, whose objectives are to investigate the reliability of tidal energy converters and develop tools to increase it. The roles of the University of Algarve are: 1) to plan and coordinate field work activities from two full scale tidal turbine deployments: Sabella D10 at Passage du Fromveur (France) and Magallanes Renovables’ ATIR platform at EMEC (UK); 2) to collect and process the resulting data; and 3) to publish the findings in a suitable format (https://www.monitoratlantic.eu/). INEGI is an Institution at the interface between the University of Porto and the Industry, oriented towards the activities of Research and Development, Innovation and Technology Transfer. INEGI has been involved in nationally and internationally funded and subcontracted projects related to Marine Renewable Energy (mainly offshore wind and wave energy). I.nano.WEC: a 2-year project, which started in May 2018, funded by the national fund “Fundo Azul”, aiming to develop the first marine buoy prototype integrating highly efficient energy harvesting systems based on triboelectric nanogenerators. The coordinator of this project is the InanoEnergy (www.inanoe.com) which is a start-up company created in 2016 to develop, prototype and produce energy harvesting solutions with applications on the internet of things. PORTOS: a 3-year project, with start date scheduled to April 2019, funded by the European funding programme INTERREG Atlantic Area, aiming to develop and promote the implementation of renewable energy (RE), especially marine energies at ports in the Atlantic Area, targeting two environmental priorities for ports: reduction of greenhouse gases emissions and air pollution, by providing RE-based solutions to harvest the Renewable Energy potential of the Atlantic coastal areas. Moreover, PORTOS aims to increase the energy efficiency of the ports, establishing a roadmap to a more competitive and sustainable sector, mitigating climate change. PORTOS project will be lead by the University of Porto. AW-Energy has granted funding from the EU Horizon2020 programme (MegaRoller project) for development of a Power Take-Off unit for a 1MW device. The project started in May 2018 and will run until 2021, with a total of €5 million funding. Two Portuguese partners integrate the consortium, WavEC and Cruz Atcheson, with other partners from Finland, Germany and Norway. WaveRoller is a submerged wave energy converter based on a hinged panel that is attached to the sea bed in the near shore area. It generates electricity from the movement of the waves (surge phenomenon) and is connected to the electric grid onshore. AW Energy’s First-of-a-Kind (FOAK) WaveRoller, which has been fully licensed in 2017, is currently in its final stage before deployment along the coast of Peniche, in Portugal. Pico Wave Power Plant, at Azores, on the island of Pico, was disconnected from the network on April 17, 2018 due to the partial collapse of the plant. The project to dismantle the plant had already been started, being prepared by both Portuguese utilities, EDA and EDP. Pico Plant has made a very valuable contribution to the promotion of wave energy research, development and innovation, both at national and European level and internationally, attracting more than 11 national and European projects. Pico Plant was part of two European networks of test infrastructure for wave energy technologies (MARINET AND MARINET2), promoting the access of international teams to the plant. The plant originated more than 100 international scientific articles and was associated with more than 8 doctoral theses and numerous master's theses and scientific internships. CENTEC/IST organized the 3rd International Conference on Renewable Energies Offshore that took place in Lisbon on 8-10 October 2018 with about 150 participants. 101 papers were presented. The proceedings were published by CRC Press. IST has been involved, since 2013, in the EUREC master course in Renewable Energy, offering a one-semester specialization in ocean energy. This took place from February to May 2018. WavEC Offshore Renewables organised its Annual Seminar 2018 on the challenges and opportunities in the offshore renewable and aquaculture industry in collaboration with the British Embassy in Portugal. The event took place on 4 December 2018. The Marine Spatial Planning (MSP) policy is used as a decision making tool. In March 2015, the Portuguese Law 38/2015 was created laying down the bases for the Planning and Management of the National Maritime Space (LBOGEM), defining the legal framework that allows for the implementation of marine spatial plans in the whole national maritime space, including the continental shelf beyond 200 nautical miles. • Portuguese Electricity Utility (EDP). - A concession is mandatory for more lengthy time periods. In this case, a competitive public examination must be carried out, starting with a public announcement by the competent authority. • Building license for infrastructure on land (e.g. substation, cable routes) administered by the municipal council of the area where the project is to be installed. An Environmental Impact Assessment (EIA) is not required if the project, including marine and terrestrial parts, is to be located outside the national ecological reserve, Natura 2000 sites and/or the national grid of protected areas. However, this decision still has to be confirmed by the licensing authority. If any part of the installation is located in an ecological reserve, Natura 2000 or a protected area (within one of the previous location/sites), an Environmental Effects Assessment (EIncA) has to be performed. The EIncA is a less demanding administrative instrument than the so called EIA. The entity responsible for the decision on whether an EIA/EIncA is required is the CCDR if it is a license, or APA if it is a concession. The baseline survey is usually made through desk based studies although some developers of the few projects that have been installed in Portugal have carried out some baseline studies as required in the declaration of the EIA. Monitoring is usually part of the EIA declaration issued as part of the environmental license. In Portugal the onerous post-deployment monitoring have been required for some marine renewable energy projects. Evidences should be given in periodic reports that monitoring in being carried out, and its results are usually analyzed by the Portuguese Institute for Nature Conservation (ICNF). Whilst there is no over-arching dedicated consenting system for ocean energy, all the required consents have been adapted to better suit wave energy developments. Decree Law 225/2007, of 31 May, amends previous legislation on electricity production to accommodate electricity production from renewable sources and establishes regulation on the EIA process for such kind of projects. Consultation is usually required as part of the legal licensing process. It is usually made after the Environmental Impact Statement is delivered to the authorities for approval. Advices are asked by the licensing authority to a number of statutory consultees namely Institute of Nature Conservation, port authorities and a number of public authorities responsible for marine resources management. There are informal consultation activities implemented during the licensing process: usually developers prepare a number of informal public events to disseminate the project and collect the public feed-back on their activities at sea. Some information on parts of the licensing process exists in the internet as part of the authorities’ website. However there is no compiled information on all process and the developer is usually the manager of the project licensing procedures. Specific regulation for the Portuguese Pilot Zone – Ocean Plug – has been produced and provisionally approved by DGEG.